Westhill's C.C. 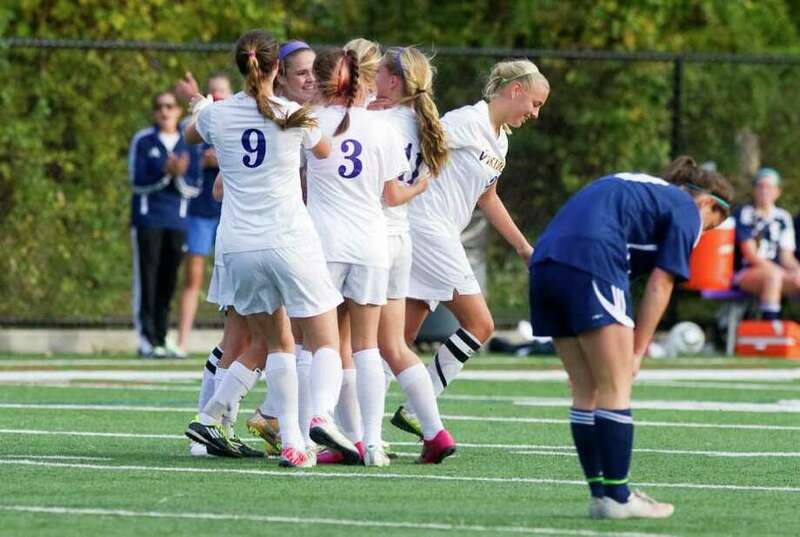 Bingham, facing left, celebrates her first half goal with teammates as Westhill High School hosts Staples in a girls soccer game in Stamford, Conn., October 18, 2011. Soccer is all about capitalizing on your chances. That was the difference in the Staples girls soccer team's 1-0 loss at Westhill Tuesday. Westhill raised its record to 10-1-1 and capitalized on its one opportunity when it scored the only goal of the game with 15:38 remaining in the first half. Staples dropped to 5-4-2 despite outshooting the Lady Vikings, 13-9, to go with its 4-2 advantage in corner kicks. "It's unfortunate but I can't be disappointed because they played a great game," Lady Wreckers coach Nikki Ross said. "The girls created opportunities and played a great game. Westhill played a great game as well and that's how it worked out." Westhill junior C.C. Bingham scored the goal when she shot it from 30 yards out and the ball sailed above Staples senior captain goalie Jessie Ambrose's head. Freshman Rachel Benz was credited with an assist. "There wasn't much Jessie could do about it," Ross said. Lady Wrecker senior captain Abby Fagan said, "They are a very good team and it was close. We had more opportunities than them, but they were able to finish and there's nothing we could do about it. I think we definitely played well but we weren't able to finish. We have to move forward and continue to play well." Senior captain Abbey Lake (four shots) kept on attacking the net for Staples but was either stopped by senior goalie Allie Souza (eight saves) or the Lady Viking defense. "We definitely had opportunities, but we just didn't finish," Lake said. "Everyone played well but we didn't connect as defense, midfielders and attack. We all played hard and tried to play as a team." The Lady Wreckers almost tied when freshman Lauren Garcia crossed it to the team's leading scorer, junior Turner Block. However, Block, who was limited to two shots all game, headed it wide. Garcia did a lot of good things out there and had three shots. "It was a good effort," Fagan said. Fagan did well in the midfield and also had three shots. Freshman Maggie Walsh had the other shot. Freshman Chloe Rosenfield was solid in the midfield as well. Seniors Colleen McCarthy and Alex Wiener and junior Siri Andrews led the defense and didn't let much get by them. McCarthy was especially strong and executed her tackles. Junior Julia Tziolis and freshman Megan Root played well on defense and Ambrose (eight saves) came up big in net. "It's very tough," Lake said. "We played well. They had only two chances but got a lucky break. We came in as the underdogs but we outworked them and held our own. It came down to who scored more." Staples hopes it plays as well tomorrow at New Canaan and Monday at Wilton, both who are solid teams. "They will be good games," Ross said.